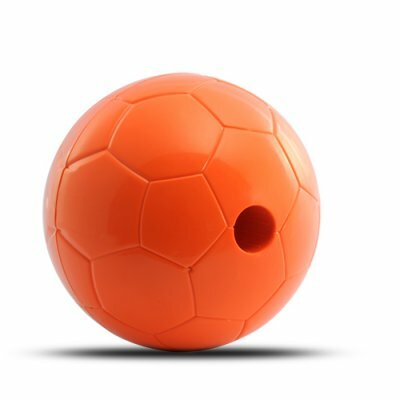 Successfully Added Autofetch Motion Pet Ball - Mobile Powerball for Dogs and Cats to your Shopping Cart. Unique new motion animated pet ball that moves around to keep your favorite pet entertained for hours on end. Just put in a few treats, turn it on, and this pet gadget / pet toy will keep your pets mind active while giving it some much needed exercise and fun. This motion powerball is both a joy for your pet as well as for you. Your pet will enjoy chasing the ball around to try to get at the treat you placed inside, while you get the joy of seeing your best animal friend play with this animated pet toy. So how exactly does it work? Simple - you just put a few small pieces of food into the treat slot and then give the pet ball a slight shake to turn on the internal auto-motion gyroscope. Now the ball will start randomly moving itself around the room. It will keep going even if it runs into a wall or other objects. The only time it will stop is if it does not get any interaction after 60 seconds. When all the food falls out of the catch slot, it is time for you to replace them with more treats so your pet can have the fun of trying to get it out of the motion powerball again (but don't over indulge them)! This fun pet ball is in our warehouse right now and available for single piece and large bulk purchases, so order yours today, and while your at it get a few extra to resell on eBay, this way you cover the cost of your purchase and earn some more money to buy some more new toys! Can I use this motion ball with my pet Rabbit or Pig or Iguana? Yes, it can be used with any pet, child, or adult human. How does the food treat come out? The treat slot is designed to let the treat fall out only when it is aligned exactly right, which is exactly a degree or two above nadir. Meaning it may take you and your pet a while to get the treat out, but it will come out if you are clever enough! on 2011-10-07 14:07:24 Do they make a smaller version for small dogs?